Submitted by Frank Mascarenhas on September 28, 2009 - 6:11pm. This is to inform you that I was a regular visitor at Sir's house right from the time I left school where I also met Teacher Mabel.Even after Sir has expired, I visit her often. She is now really old & house-bound as she has no confidence in herself. She feels happy when any of the old school boys go over to see her. Submitted by salim tabani on August 19, 2008 - 4:16am. Does anyone know how to get in touch with Atul Khanna? Cyrus, yes that is Chinky, but who is to the immediate left of Atul. He is so familiar and I remember his face clearly and many of the others in the picture. Nice to see Br. Dephenna here. Does anyone also know where Dennis Gaitley is? Submitted by Frank Mascarenhas on January 28, 2010 - 5:32pm. Submitted by salim tabani on June 23, 2010 - 7:23am. Submitted by cyrusbulsara on May 20, 2007 - 7:44pm. Hey Percy, where are you? I saw the pic and recognized Atul Khanna, Chinky ?David's bro and Frank. I see Master Donald in the background with Fr. Casale. I rmember some of the faces but cannot remember the names. Don't know about Mabel Andrade. The Bandra boys like Admin/Gerry Mas.Â would know better. Submitted by Percy on May 20, 2007 - 12:55am. 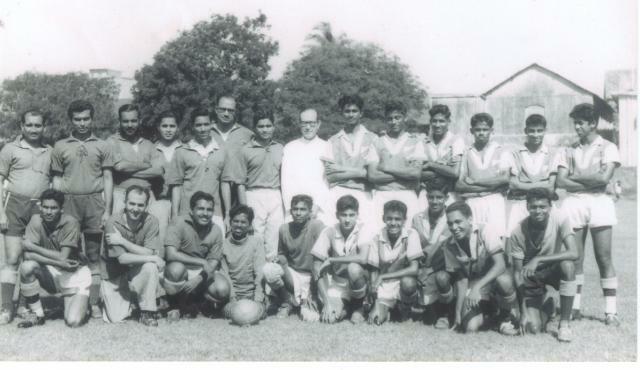 Mr Oliver Andrade, was an excellent coach, he coached me in both hockey and football in 1957/58/60. I always remember him for his robust ways but was always fair to his players. I think his wife's name was Mabel, does anyone knows how I can get in touch with her, I think they lived in Bandra. Submitted by admin on May 20, 2007 - 8:55pm. I just spoke with Mel Rodricks our Vice President and he mentioned that Mabel Andrade is alive but house bound. We will find out if she is in a position to speak over the phone. Submitted by Gerry Mascarenhas on November 7, 2006 - 12:58pm.